Do you run a business that sells products or services to customers online? Are you planning to engage in an online business to sell your own product? If yes, then you need fast and precise online invoicing software to have an effective and efficient billing system. Gone are the days of doing everything manually where it didn’t only require a lot of people, it was also prone to errors. You don't want customers to wait for a very long time due to an inefficient billing system. That would be one of the worse things you could do to your customers. Even worse would be losing invoices in the system which you would then have to manually track and locate. There are many problems that can arise in a business. Make sure that these won't be one of them by getting AccountSight today! Not all time and billing software is the same and as efficient like the other. Use only the best invoice tracking software; get AccountSight for easy time tracking and accurate billing. AccountSight has all the features you need for a worry-free billing system that is fast, accurate, user-friendly and customizable to fit the needs of your business! Read on and see what AccountSight has to offer you and your business. AccountSight is an online invoicing program that is guaranteed to be user-friendly and is sure to provide just about everything you need for your business. This feature-packed software offers rapid time tracking, rapid expense tracking, fast and accurate invoicing and reporting. Businesses, regardless of their size, will have a huge advantage in using AccountSight. This invoice tracking software can manage hundreds of users that need to pass through multiple levels of workflow. Even for small businesses, it is very important to have an efficient billing system. It is the most crucial aspect of a growing business because if you do not invoice your customers, you do not get paid. You get negative cash flow. Business owners should be focusing on how to grow the business and not worry about the processes involved in the business like the billing system, for example. Why do it manually when you can do it in an efficient and systematized manner? There are many benefits of using AccountSight as your online invoicing software for your business which will be discussed below. Why You Need An Invoicing Software? There are many online invoicing software available out there in the market today but why should you choose AccountSight? Whether you handle a big corporation or you run your own business venture, having AccountSight will help you in many ways. Running a business on your own is an enormous task. There are simply too many things to manage in a business where each is as important as the other. Managing invoices that you issue to your clients for your products or service might sound like a minor thing you can think about later. But mismanaging this can lose you money and make you look unprofessional with your current clients. If your cash flow suffers, then your business suffers. There are tools like online invoicing programs that will help you lessen the load off your shoulders by having a fast and accurate billing system. Having one will help you focus on other more important things in your business, things that aim for growth and expansion. So if reducing the time taken in processing transactions is what you aim for as well as fast-tracked and accurate invoicing, AccountSight is certainly what you need! Check out the features of this online invoicing software and see why it stands out above the rest! Have you used a program before that bugs down when the hosting server is down? Problems like these may not happen frequently but when it does the trouble it causes can really be costly. It doesn't only delay the processes in your end, clients will not be happy with the delays as well. With AccountSight, having a cloud-based system, there's no need for that nor additional hardware or even software installations. You only need internet access to access and use AccountSight! With that, as long as you have internet connection, you can work with your invoices and bills anytime and anywhere! If fast time and billing software is what you need, that will certainly be what you'll be getting with AccountSight! The software can automate certain adjustments like taxes and discounts to a faster billing system. You can also personalize and have your own configurations like billing items, time period, expenses and other variables. AccountSight offers three different online invoicing options; manual invoices, invoices based on project time and expenses, and recurring invoices. 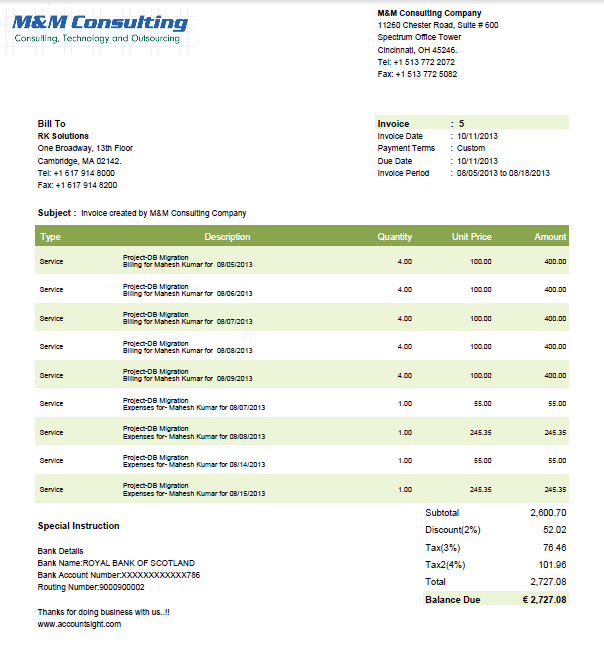 Manual invoices are used for those that would require manual adjustments based on real-time changes during the process. If your business process is prone to sudden changes in purchases and other alteration, having this feature is crucial which is available in AccountSight. Project time and expense based invoices are simply based on those that are recorded by employees on a weekly basis. Recurring invoices are for those transactions that recur on a regular basis. Wow your clients with colorful and stylish invoices! Aside from the typical colors that invoices come in, you can configure your invoices to have the same color as your business's color theme. AccountSight also has dashboards where you can clearly see cash flow and accounts receivables. In addition, there are filters to help you navigate through all the data quickly and efficiently. If invoices are passed through many levels of approval, it is very important to have each assignee notified. AccountSight invoice tracking software comes with a flexible and smart notification system that will help you manage invoices efficiently and substantially reduce payment delays. You can get all of these features in one online time and billing software. Don't miss your deadlines and avoid costly delays. Have only the best in the invoice management software for your business. So get AccountSight today! Sign up for a free trial without any obligations – No credit card required.